To some, DevOps is about culture, to others it’s a software development methodology on its own. While there will always be discussion and favorite definitions, DevOps has generally come to encompass a philosophy that emphasizes communication, collaboration and cooperation between software developers and the other stake holders in the information technology industry. DevOps has come to be recognized to incorporate a whole set of tools and technologies that seamlessly integrates the application or software development lifecycle from spec to design to development, testing and deployment. Properly implemented and integrated, these tools enable Continuous Build, Continuous Integration, Continuous Testing and Continuous Deployment. Thus, DevOps enables incremental, continuous deployment of small changes and updates to products and websites with minimal to zero downtime. In today’s world of SaaS based applications delivery and consumption, DevOps has become a critical success factor for technology vendors to deliver newer product features, defect fixes and performance and security updates in near real time. A primary advantage that Kanban has is that it encourages teams to focus on improving flow in the system. As teams adopt Kanban, they become good at continuously delivering work they have completed. Thus, Kanban facilitates doing incremental product releases with small chunks of new functionality or defect fixes. This feature of Kanban makes it very suited to DevOps’ continuous delivery and deployment requirements. The other big advantage of Kanban is how it enables you to visualize your entire value-stream and ensure stable flow. Thus, it helps you combine the workflows of different functions and activities right from Dev to Integration/ Build, Test, Deployment and beyond that to application monitoring. Initially, it will help your Dev and Ops people to work in a collaborative manner. Over a period of time, you can evolve into a single team and single workflow that includes all of Dev and Ops activities. Kanban provides you visibility to this entire process – and transformation to a DevOps culture. What needs to be fixed – mapping you workflow shows you what needs to be fixed first with the processes you follow. Indeed, with Kanban, you begin with what you’re currently doing and then try to continuously improve. Priorities – Your stakeholders know what’s (what work items are?) prioritized with just one glance at ‘the board’. This ensures that the right/ important work is picked after taking into consideration how it affects the overall stability of the system (picking the right one ensures minimum friction is introduced). This ensures that every team (including internal customers) knows what’s in alignment with the business’ (department’s) goals. Blocked worked is immediately noticed – if there is a dependency or issue, the decision makers/ resolvers can immediately step in and figure out what to do next – there is no cost of delayed feedback. The pull system – Kanban encourages you to ‘stop starting and start finishing’ – ensures that you spend your time on a minimum possible number of items at a time thereby reducing frequent context switching and loss of productivity. This also ensures that flow is constant – when you’re stuck on one task, there’s nothing preventing others from pulling new work i.e. the overall system is stable. Automation – the board shows how your work flows, where your bottlenecks are, what your cycle time is – in effect showing you where automation might help and what needs to be improved. Kanban cannot replace strategy and intent – you need to have developers who are willing to do bits of QA and understand how much change they can introduce into the system without disrupting the flow and you need your operations team to understand what changes (features) to prepare for to ensure stability. It can definitely help with both though – when you have everyone on board (literally!) there is less tension all around and ensures every function (and individual) is more effective and knows what exactly needs to be done. While Scrum can and does work well in delivery environments where the need to deliver may not be truly “continuous” (after all you are working with a minimum of a 2-3 week sprint cycle), Kanban’s very nature makes it more suitable. If you look at most DevOps implementations in the field – you’ll find it’s difficult to fit it into a standard sprint. Kanban’s pull rather than push and the concept of flow that forms its basis sits rather well with DevOps. 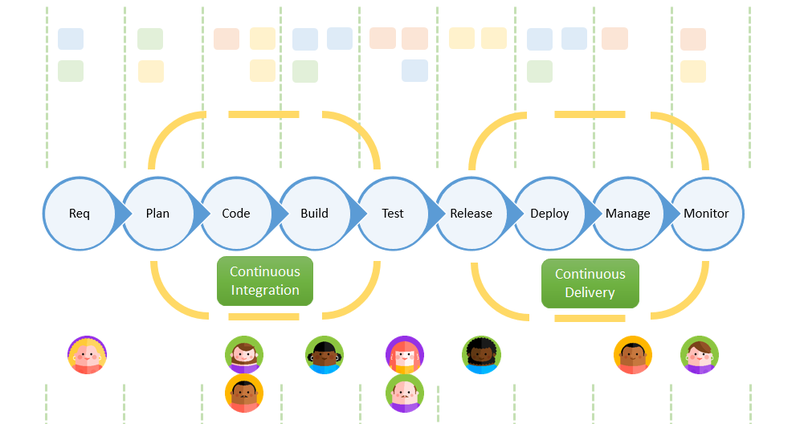 Also, continuous delivery and Kanban work well together – both are just-in-time systems that focus on getting one thing right at a time (most of the time!). And course, the flexibility that Kanban brings in is an added (and necessary?) bonus. Your dev team can track their own work on a separate Kanban board. For the basics of a Kanban board read our article on Kanban Boards. We wouldn’t suggest applying DevOps at the user story level. Whatever you define as your MMF (minimum marketable feature) or Epic, or Release (any unit really) should probably be WIP limited, not individual stories. It’s possibly the only sensible easiest way to help map and manage your entire value – stream. Have you already adopted DevOps? Are you evaluating the use of Kanban for your DevOps teams? Using SwiftKanban and our integration product SwiftSync, we can help you get your DevOps solution up and running in no time at all. Just drop us a line at sales@digite.com or sign up for a free trial! If you would like us to work with you to develop your own DevOps solution, just let us know.